The HIV/AIDS epidemic s having a major impact at all levels of society, from the individual to the macro-economic. At the micro-level the impact is particularly devastating, not only for the individual who is infected, but also for his or her family and the community .traditional methods of care and support are put under tremendous pressure as families lose their capacity to cope. Rising Fountains Development Program is in the forefront of the battle to provide effective care, counselling and support to those affected, and to develop new interventions to prevent the spread of infection. This AIDS news brief looks at the implications of HIV/AIDS for the workers and the organization and at the type of responses, which are required by practioneer and managers in dealing with humanitarian health. Nothing is more fundamental to human happiness than good health. Yet across the world millions of people have no access to healthcare services and millions more live under conditions that put their health at risk. 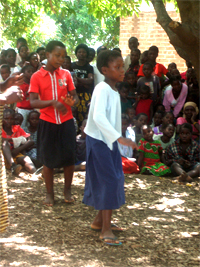 The objective of RFDP is to combat HIV/AIDS and opportunistic infections and improve access to health care through training local communities in HIV/AIDS prevention and care and primary health care and working in partnership with the Ministry of Health to improve access to Voluntary Counseling and Testing (VCT) and Antiretroviral Treatment (ART). 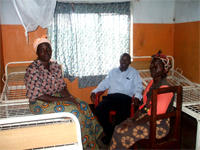 Primary health care have been at the centre of RFDP Health Programmes in Lundazi and Zambia in general. 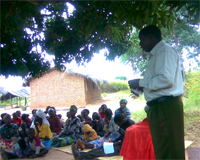 We provide access to Voluntary Counseling and Testing (VCT) to people in Lundazi district. Provide care, Treatment and support to people on ART. Distribution of Information, Education and Communication (IEC) materials on various health programmes. 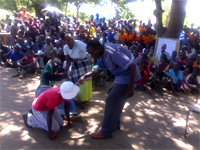 Awareness and sensitization on the importance of ART. RFDP is also involved in Prevention of Mother to Child Transmission (PMTCT) of HIV. Research has shown that this can be implemented in settings with limited resources.15% of new HIV infections each year are caused by MTCT and that elimination of HIV infection in infants and young children would serve to accelerate global HIV prevention effort. 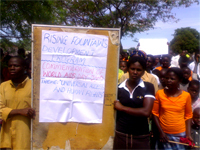 Rising Fountains Development Program, also provide access to information on referrals for the chronically ill and the sick from Communities to health Centers. We work with the local chiefs/or the traditional leaders, to provide a forum for communities to come and learn more about HIV/AIDS and how to access support locally and at district level. In 2004, environmentally related diseases, like diarrhea and malaria, claimed approximately 5 million lives, and caused many millions more people to suffer long and debilitating periods of illness or injury. 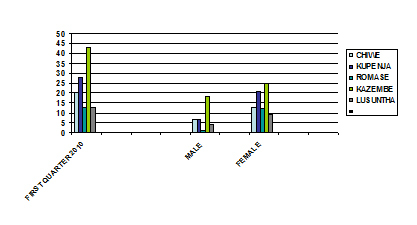 Below is the graph to show the number of people living with HIV+ in the operational area of Lundazi district. Poor health can be a product and a cause of poverty, as people are unable to work, attend school, or care for their families. Donate to this project: $20 $50 $100 $1,000 or more.